As we step out of the small power boat and board the Spirit, Captain Mark Kocina with Central Coast Sailing Charters helps us find our seats circling the teak table in the middle of the 44-ft. sailboat. The rimmed edge of the table gracefully and safely holds the two teak boxes he brings up from the galley below. Filled with grapes, apples, oranges, nuts, crackers, and chocolates, it’s the first thoughtful touch of many we’ll experience on today’s adventure. The next is our choice of beverage: Central Coast red or white wine, 805 beer, Coors Light, or bottled water. 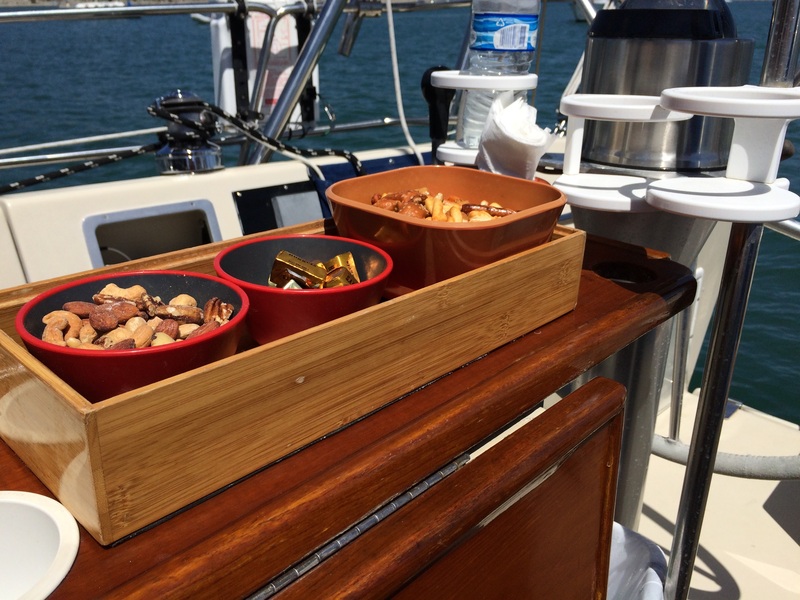 Teak boxes holidng treats are just one of the thoughtful touches offered by Captain Mark and Central Coast Sailing Charters. 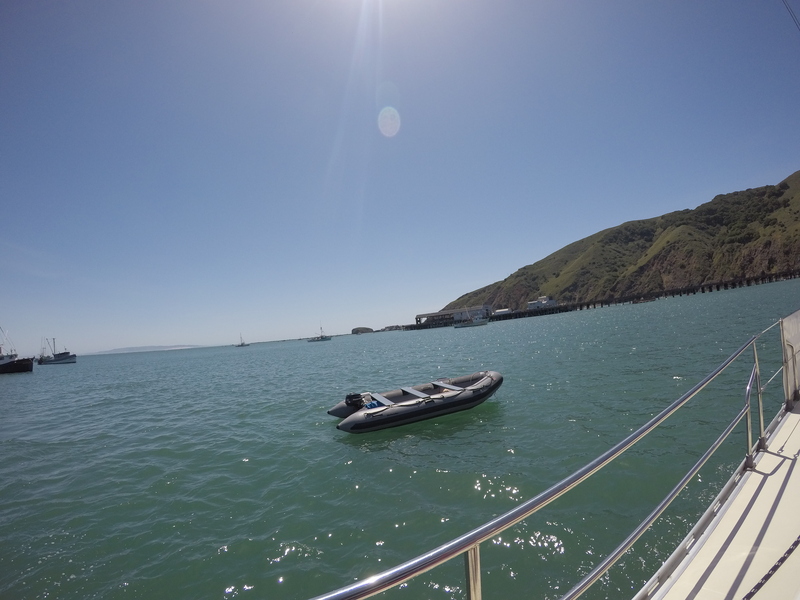 The Flavor Team is enjoying this afternoon sail with a family of four, whose daughter is a student at Cal Poly. Our group’s response? A quick and unanimous yes! Captain Mark starts the auxiliary engine and we head toward the open sea. The Flavor Team has been out before with Captain Mark on the Spirit. Today is my third sailing trip and Andrew’s second. My previous trip last fall was a gift from the sea. Gray whales breaching all around us, almost too many to count, almost close enough to touch. I will remember that experience all of my days, and the feeling of sheer gratitude to be sharing a moment in time with these magnificent beings. We leave the powerboat and Avila Bay behind and head for the open sea. 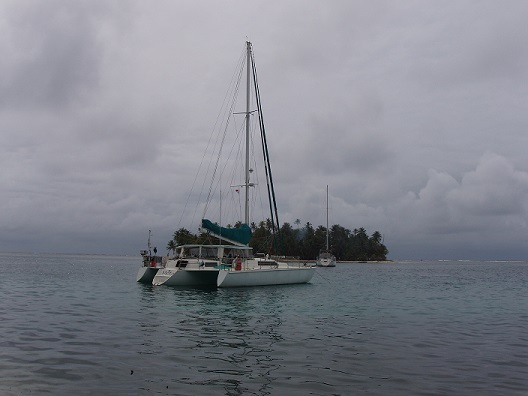 We pull away from the anchorage, leaving the small powerboat tied at Spirit’s mooring, and Captain Mark asks if anyone wants to help steer the boat. With a few instructions about keeping the arrow on the mast pointed straight ahead, one of the daughters in the family does a great job taking us out to sea. Whale Rock flanks the western edge of Avila Bay near the breakwater. In 1894, the rock was a country all to its own. With a little downtime before he needs to concentrate on sailing, we ask him what it is about sailing that captivates him. 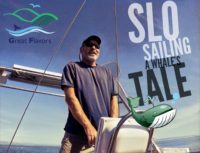 A true storyteller, Captain Mark weaves in the history of the area and the ecology of the sea along with the basics of sailing. Beyond the calm of the bay, the wind rises and he raises the mainsail. We’re under way. For the next two and a half hours, our group is greeted by the shimmering dark hellos of Humpback whales. Often swimming in pairs, they surface, blow, and descend again. Port side on the Spirit. Whale spouts ahead! Off the port side, the water seems to boil as dozens – maybe close to 100 – of sea lions arc through the water. Further ahead, flocks of cormorants and pelicans circle. “The whales bring the fish closer to the surface, and the whales also work in groups to circle the fish with a ring of bubbles to concentrate a lot of fish in one place. The sea lions and birds know that, so they head to the same place and reap the benefits.” Symbiotic relationships exemplified. Captain Mark has come a long way from his childhood in Monterey, where his first job at age nine was sailing boats back to harbor for $1 a day, but he’s never the left the ocean. Instead, the ocean currents have led him around the world. Early on, his love of the water also meant surfing, boogie boarding, ocean kayaking, and swimming. When he wasn’t on the open water, he was guiding white-water raft trips. His first trips at age 17 were on the American and Kern Rivers, which led to his international rafting guide license and leading trips in Alaska, Canada, Costa Rica, Chile, Africa, Fiji and New Zealand. 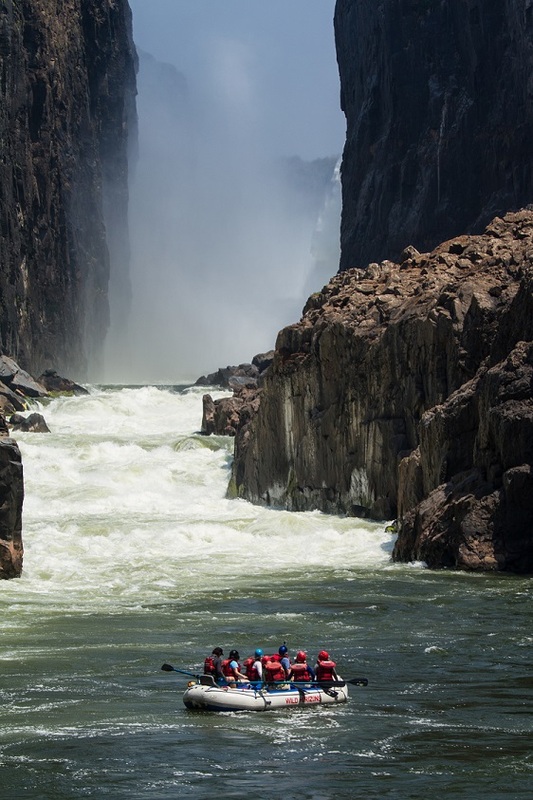 This, in turn, opened the door to be the off-camera rower for Meryl Streep’s character in “The River Wild.” Captain Mark still leads raft trips, most recently down the Zambezi river in late 2016. He earned a place on the US Whitewater Team and they won a silver medal at the 1996 World Championships. When he was 30 years old, he qualified for his Captain’s license, and added Delivery Captain — ferrying large sailboats to new locations — to his resume. He taught himself celestial navigation, a vital skill as he and his friends sailed a 30-foot sailboat to Central America. Later he met his future wife while sailing and surfing in Mexico, and they eventually made their way to the US Virgin Islands. There, she taught about marine natural products and chemistry at the University of the Virgin Islands. For six years, they lived on the boat and called the Virgin Islands home. From there, trips took them to many spots in Central America and beyond. But when their new daughter was born and his wife got a job teaching at Cal Poly, it was time to head back to California. They set sail for a six-month trip back to the Central Coast. 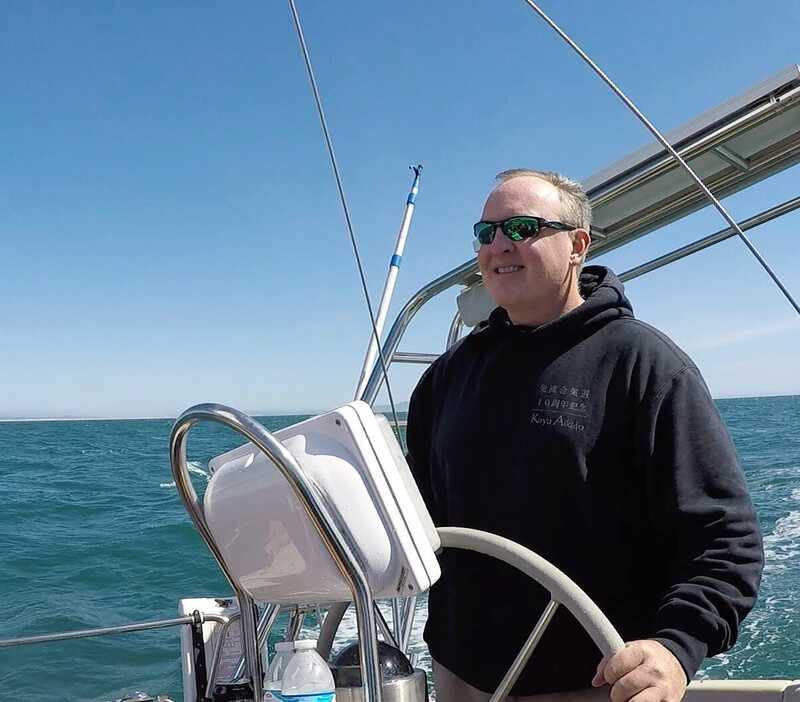 Soon after they arrived back in California, Captain Mark got a dream job as Captain for the Science Under Sail program at Monterey Bay Aquarium. For three years, he took groups out on a 65-ft sailboat, the floating classroom for teaching and exploratory learning of the ocean environment. The aquarium also hired him to do research work: tagging Great White Sharks, monitoring sea otter activity, mapping the sea floor, and more. While the job itself was great, working far away in Monterey became a challenge. 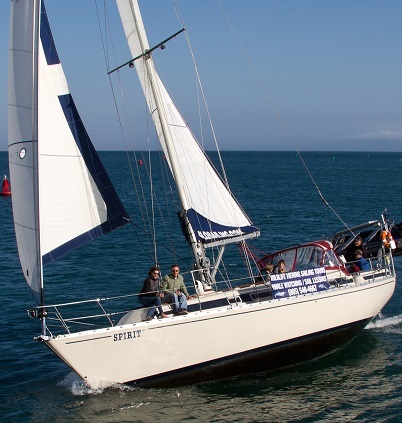 So, six years ago, they bought the Spirit and launched Central Coast Sailing Charters out of Harford Pier in Avila Bay. 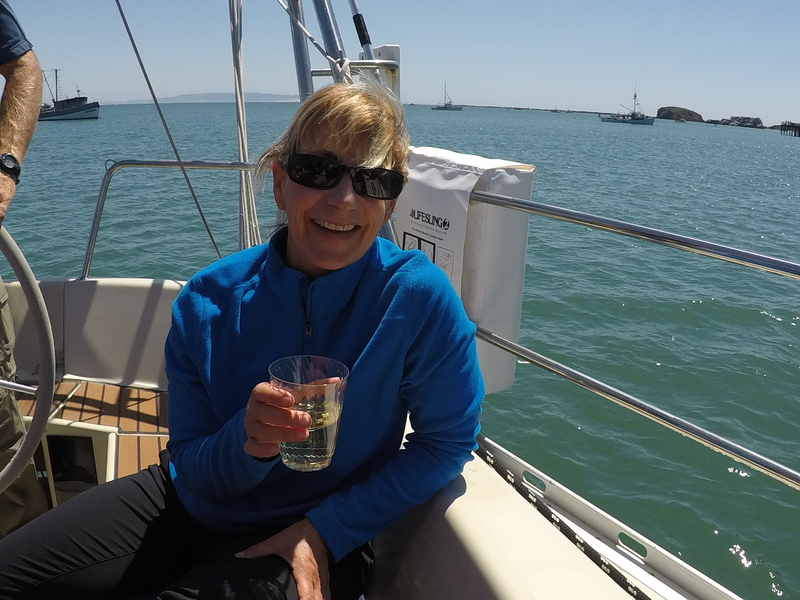 business: guiding sailboat trips while sharing the fascinating ocean ecosystem and insights into the lives of sea creatures that most of us will otherwise never know. On every trip, there is the opportunity to see some sort of wildlife, from the otters who call Avila Bay home, to Gray and Humpback whales as they migrate up and down the Central Coast, and the large variety of sea birds. But like the ocean, which reveals a whole new world just beneath the surface, Captain Mark is more than just a first-rate seafarer. He’s also a continual student, seeking to grow and learn both about operating a successful business and bringing more depth to life. Personally, he’s exploring the spiritual side of yoga as a practice to bring calmness and kindness to every situation. Business-wise, he’s accomplished his first goal – sharing his love of the ocean through creating his sailboat charter business. His next goal is to share this experience with more people. Captain Mark shares sailing tips with Andrew. He recently added a power boat to his fleet and another Captain to his team. 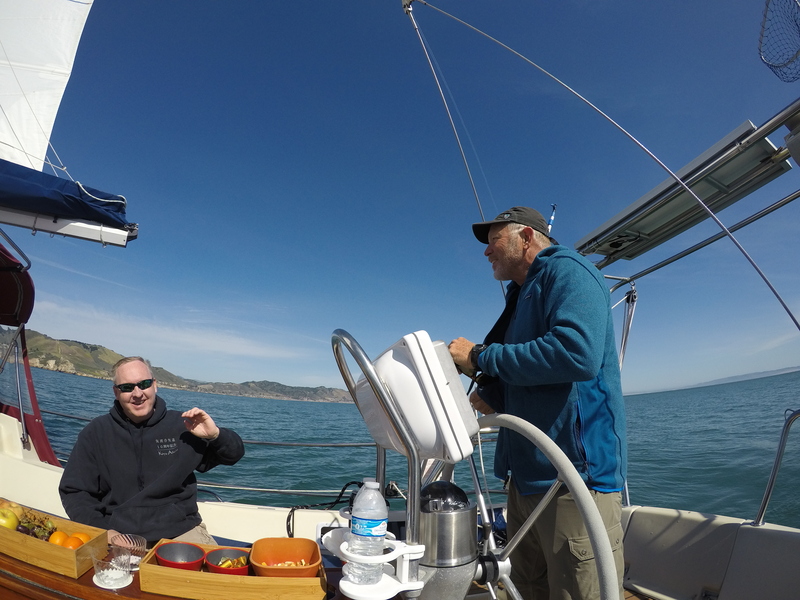 Captain Mikael Brink, who has been providing whale-watching and coastal tours in Morro Bay, will be providing the same tours out of Avila Bay on his 21-ft. search-and-rescue style adventure tour boat, the Peregrine. 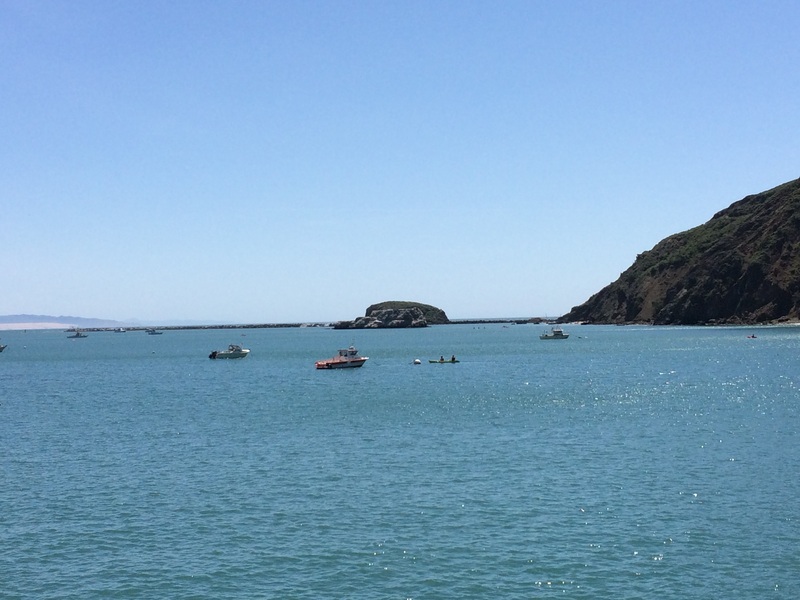 In addition to whale-watching, Captain Mikael will offer coastal tours of the bay around Port San Luis and the nearby sea caves of Fossil Point through the sister-company website, www.slotours.com. So far, 1.5-hour morning whale watching tours and 1-hour bay and sea cave tours are offered on the Peregrine. “Having two boats means we can offer more tours, perhaps some shorter whale-watching tours, and help more people experience the magic of the ocean,” he said. An added benefit of a bigger boat is the opportunity to offer longer trips. “I’m thinking of leading five-day trips to the Channel Islands, dive trips to Monterey Bay and Catalina Island, and more,” he said. It’s No Fluke. We Find the Whales! To capture better video and have the opportunity to have a closer look at the whales, Andrew and I move to the front of the boat and sit on the hull. 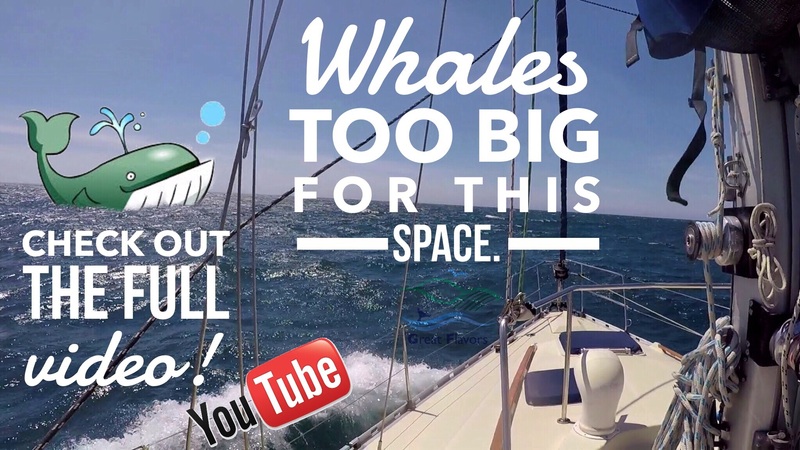 We see so many whales they won’t fit in this little space. See them in action! Click the green Feature Video button at the top of the story. The show continues. In front and on both sides of the Spirit, the Humpbacks surface, their black dorsal fins slowly slicing through the water. Some blow water spouts and descend again. 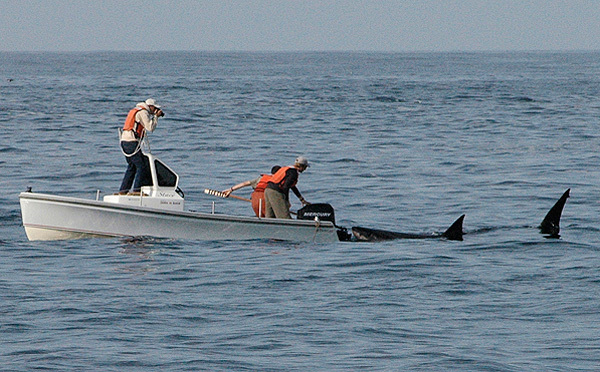 Others arc high enough for us to see their tail, which Captain Mark says is about 12 feet wide. It’s magical. To be in the presence of these great creatures, who are choosing to swim near us when they could easily and quickly leave, fills us both with appreciation. Our 2-1/2 hours on the ocean goes by in a flash. Too soon, Captain Mark turns Spirit around and begins taking us back to Avila Bay. Flavor Team member Andrew steers us back to Avila Bay. Andrew takes a turn steering the boat. 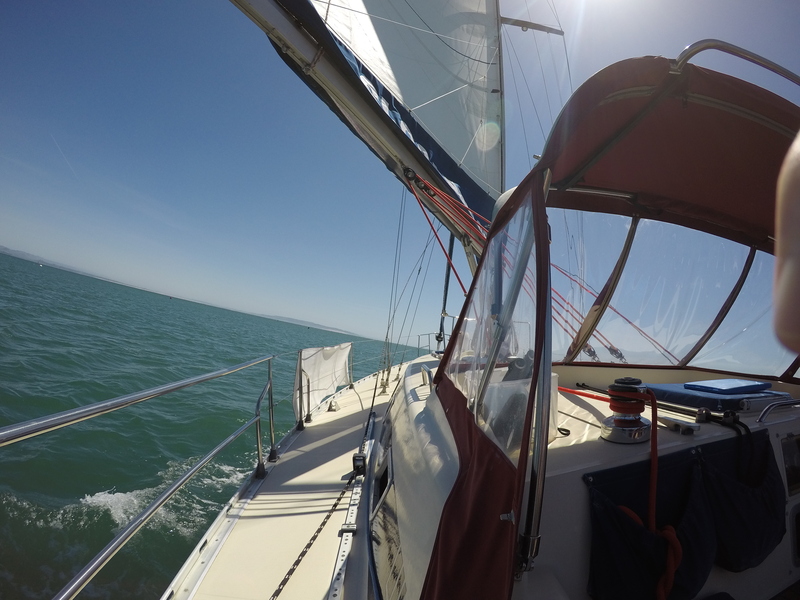 Later he shared how calming it was – how time slows down and it becomes just you, the wind, the sailboat, and the sea. As I sip the rest of my Pinot Grigio and gaze at the ever-moving inky sea, I think about the day. When we pulled away from the dock, of course I hoped we’d see Humpback whales. I’m thrilled we have – and so many of them. Then I smile. Seeing whales was a joy, no doubt about. But if we hadn’t seen any today, it still would have been a great trip. Sailing is a good for the soul, and time spent with the waves and with people who appreciate savoring these priceless moments is time well spent. Any day on the ocean is a good day. And today? Amazing. The Flavor Team sincerely thanks Captain Mark and Central Coast Sailing Charters for sharing his time, his passion, and his knowledge with all of us — what a great-flavored day. Currently, three different sails are designed to meet the interests of various groups. Check the SLO Sailing website for the most up-to-date information. 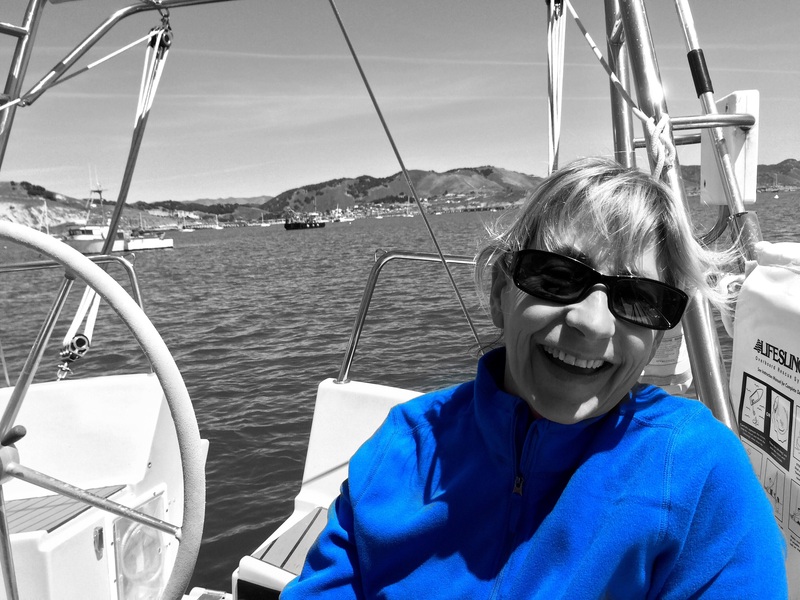 The Morning Sail is geared toward families with young children or those desiring a little quieter experience exploring the creatures who call Avila Bay home before heading out to the calmer morning sea. The Afternoon Adventure Sail typically explores the sea caves and sealife closer to shore and then heads out to sea for some bigger waves – and whales whenever possible —and a taste of the sailing experience. The Evening Sail, offered from mid-March through late September, attracts mainly adults (although any age is welcome). Depending on the day and the time of year, the water can be calmer than the afternoon and the end of the sail may coincide perfectly with the sunset. Tours are reasonably priced, and Captain Mark also offers private tours and ash-scattering remembrance ceremonies, as well as sailing instruction.